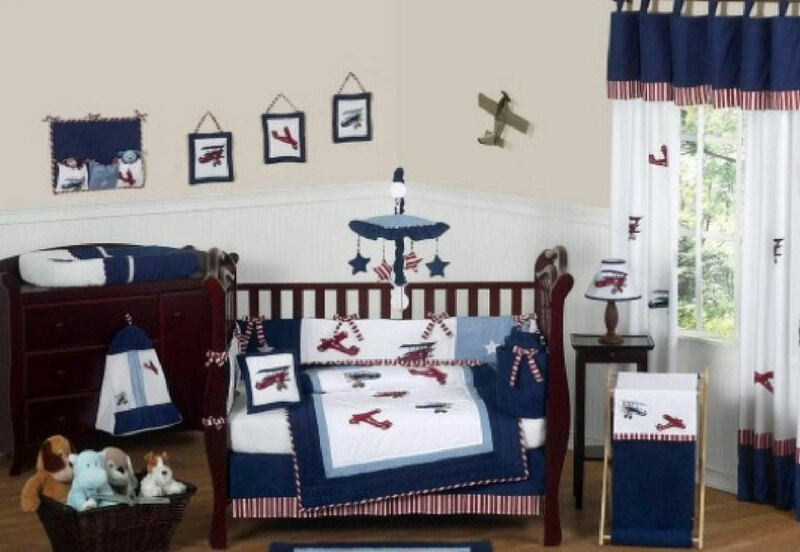 Airplane Themed Baby Room Decor Ideas: Create That Perfect Look! 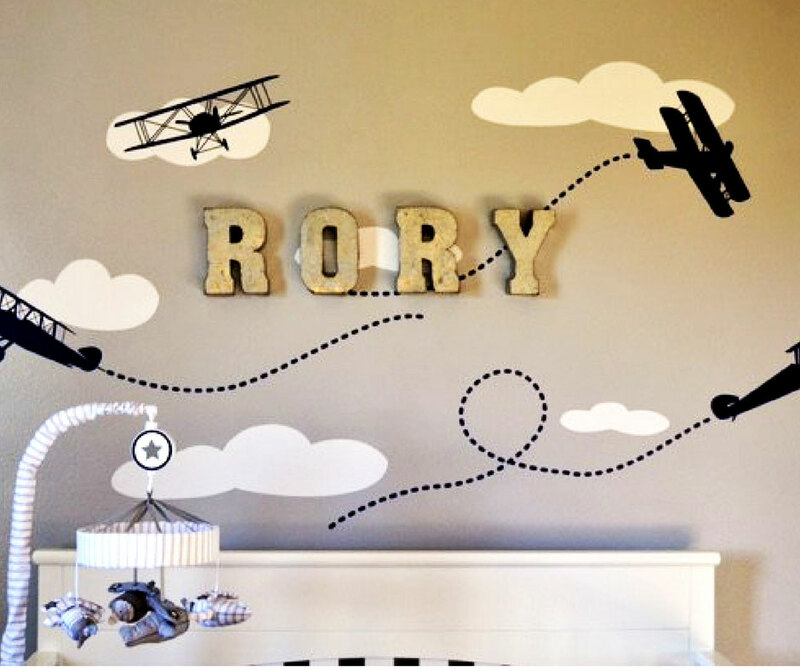 An airplane themed baby room is one of the classic room for baby boys — but it is also now slowly becoming just as popular for girls, too! 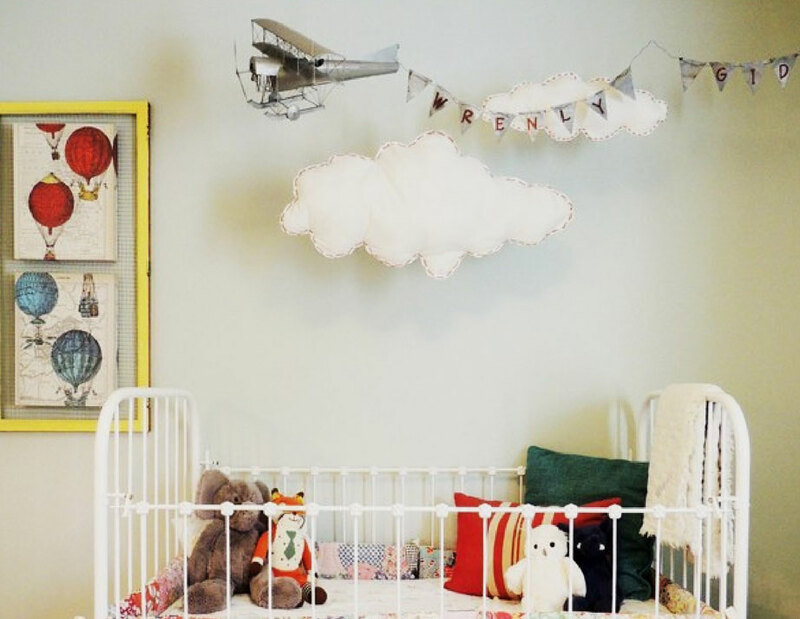 Here we feature some cool ideas to decorate a nursery with an aviator theme. I love the many adorable decors and bedding ideas for this type of room. So Lovely… What Do You Think? The bedding is a great place to start with a theme. This aviator bedding set by Geenny collections has 13 different accessories that’s perfect for the airplane-theme feel. The set includes the comforter, bumper, fitted sheet, skirt, window valances, wall art decor, diaper stacker and more. Just with this set alone, the nursery is already going to look lovely. If you don’t want a lot of pictures on a bed bedding, any blue and white sets would also fit well in a baby room with an airplane theme. 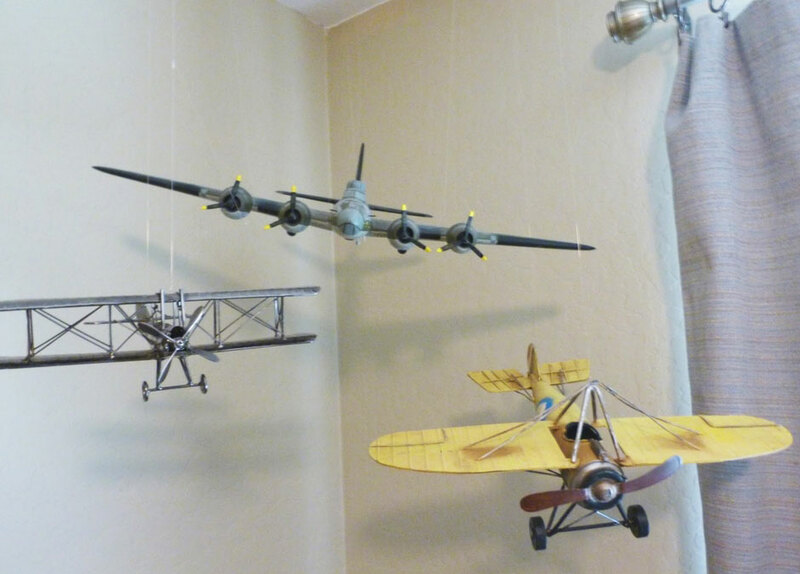 There are a lot of different airplane furniture and accessories for an aviator-themed baby room. Hanging an airplane in a nursery with an aviator theme makes it very stunning. My favorite ones are those that are not just decorative but also have a practical purpose like baby mobiles or light bulbs. These airplane decors (though some are not for hanging) make good decorative pieces as well? 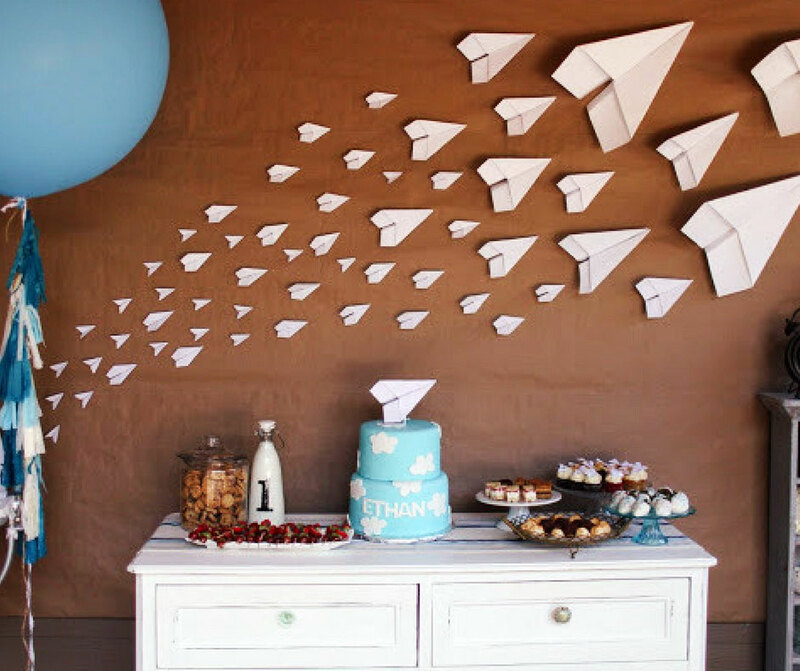 Have a look at these different ways you can decorate with hanging airplanes. A question answered: How do you hang an airplane on the ceiling? Some of you have asked this question. This discussion from Instructables has some good ideas on how to do this. The best tip I’ve seen here is to use fishing lines which you tie on to the plane. The suggestion is to use three different lines, but I think this depends on the type of plane you’re hanging. You then tie the lines to hooks on the ceiling. I’ve found these lovely pieces of travel/aviator/airplane theme decorations. They’ll make a nice accent piece for something that looks very unique. My only problem with these is they’re not exactly the kind of decorations you want your little one to be playing with when he gets into the grasping, putting everything in his mouth stage. 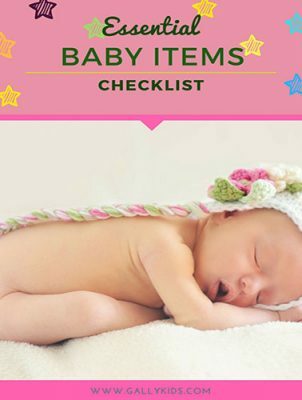 However, you can use them as a decoration for a very young baby and then keep it away from his grasp when he reaches this stage.You can even put them away at that time and then put it back again in your child’s room when he/she is a little bit older and can understand that these things are not for playing. Just look at these lovely lovely things? If you’re looking for some more ideas on how to decorate the room, here are some that I like. Here’s from Little’s Life And Laughter. I especially like the wall decor and the mobile and the lovely toned-down colors. 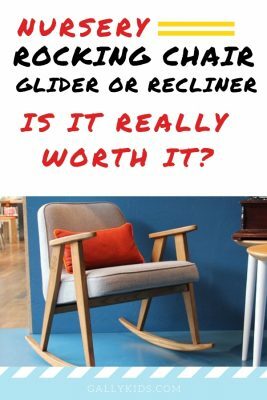 The airplane cushion on the nursery glider is also a nice touch. 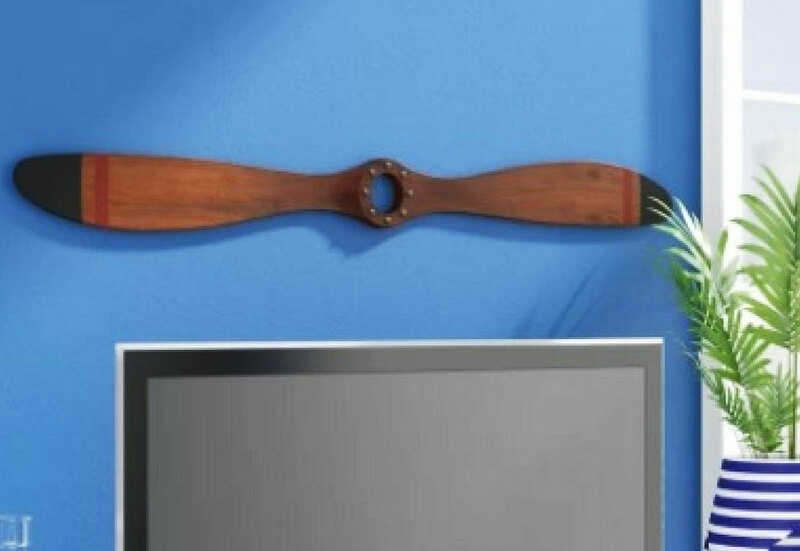 How about putting a wood airplane propeller on the wall? This lovingly crafted design by Beachcrest Home is made of solid wood. Are you up for a little bit of DIY? Here’s an easy one to do. 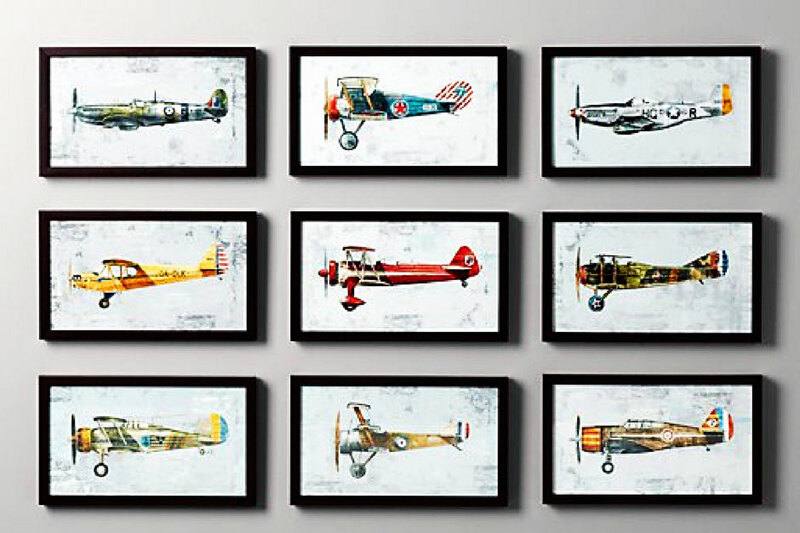 Print some airplane pictures and then frame them. And voila! You’ve got a nice aviator themed wall. Simply Made By Rebecca has made it easy for you to print some vintage images from the New York Public Library Digital Gallery. They look nice once framed, like the image below. Here’s another one that you can print from How to Nest for Less. 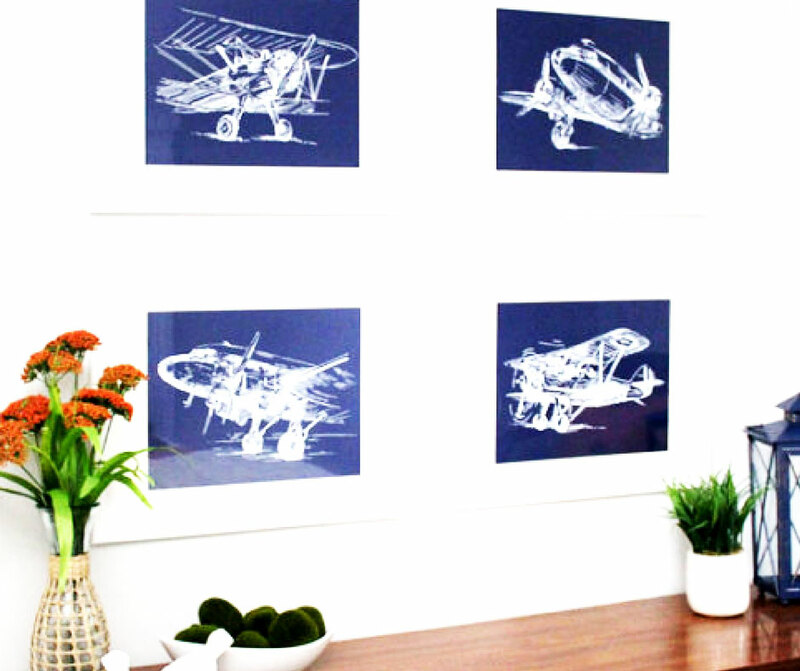 They are vintage sketches of airplanes with a blue background. Very nice. If you’re not into DIY’ing things, don’t be intimidated by this. It is an easy one to do and these pictures can make a big difference with how the room looks. Here are two different ways to frame pictures if you need help. Note: this one is an easy way to frame a picture. Just know there’s one swear word at the start. If you want something different, why not make a frame cardboard? Here’s a tutorial on how to do it. 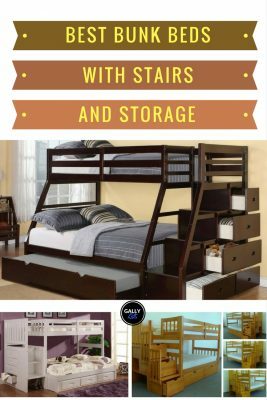 Add a unique piece of furniture with airplane shelves. This isn’t always an easy one to get hold of. You may have to go to vintage or specialist shops to find a piece of furniture that’s in an airplane form. 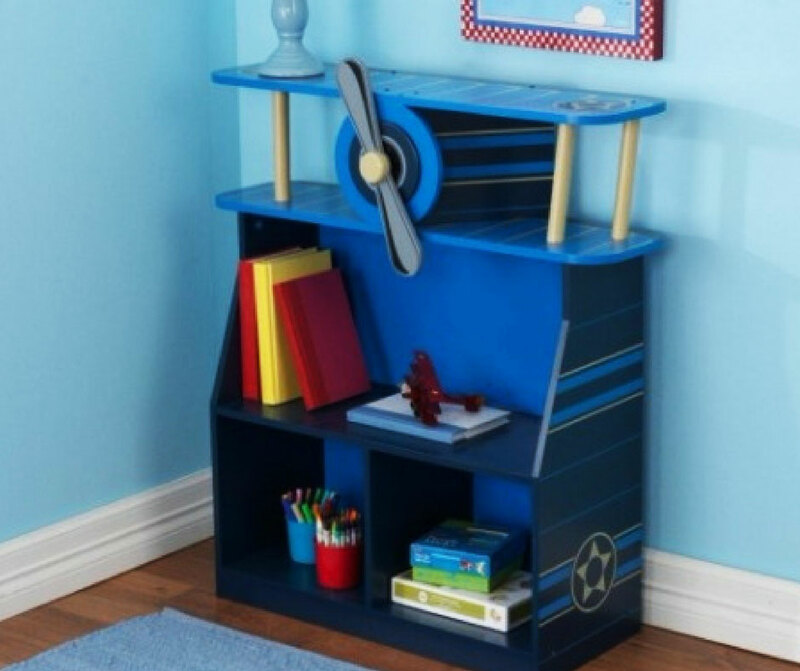 Kidkraft has an airplane bookcase that might be of interest to you. However, why not make your very own for a unique bedroom piece? 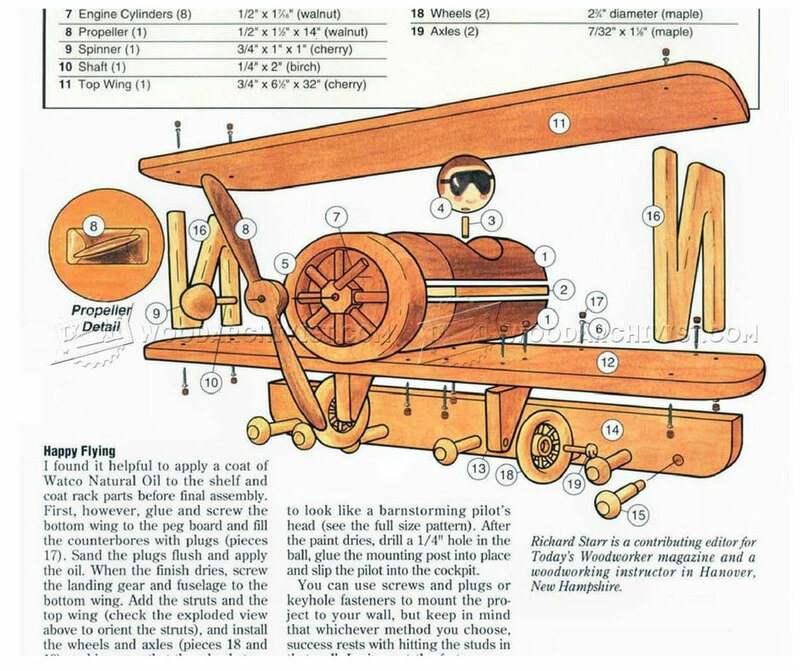 Here’s Ana White with instructions on how to make an airplane bookcase the easy way. She used whiteboard boards for this, screws and some glue and voila! 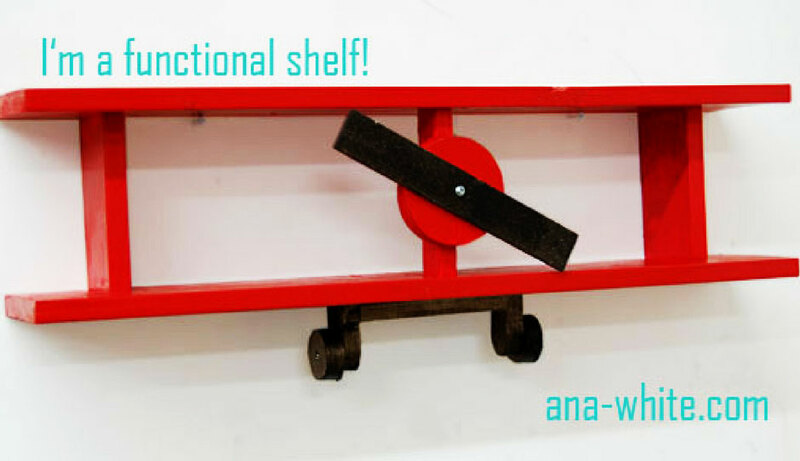 NOw if you’re a confident woodworker, this bookshelf from the Wood Archivist is pretty amazing. It’s also doubles as a coat rack. 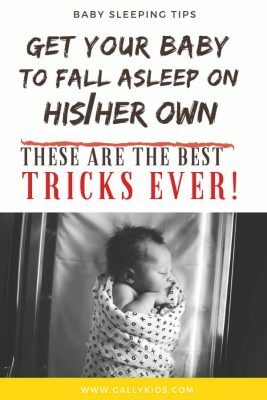 Hope you like all these ideas for an aviator themed baby room and that you’ll find one that you can use for your newborn’s nursery. 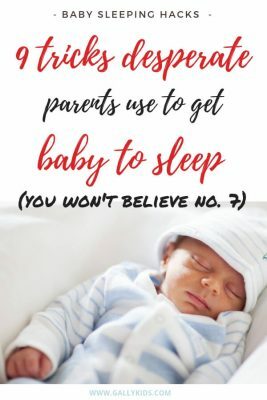 Do send me a picture if you do so I can post it here to inspire other moms!